Aspiring scientists, inventors, medical professionals and more filled Southern Illinois University Edwardsville’s Morris University Center during the regional Science and Engineering Research Challenge (SERC) hosted by the SIUE Center for Science, Technology, Engineering and Mathematics (STEM) Research, Education and Outreach on Saturday, March 23. The 35th annual competition featured the finest STEM-focused student projects from a 10-county area. Approximately 150 participants, grades 5-12, presented their findings on topics related to aerospace, biochemistry, botany, chemistry, electronics, materials science, physics, zoology and more. Edwardsville High School senior Amari Brooks used carbon dioxide collection to determine which antifungal agent eliminates the most yeast. The aspiring doctor appreciated the experience and exposure that SERC provided. Seventh grade student Nyah Ramirez from Good Shepard Lutheran School in Collinsville took to the kitchen for her research project: Cake Tastrophe. Logan Tallon, a fifth-grade student at Albert Cassens Elementary in Edwardsville questioned: How Dirty is Your Phone? Which Method is Best to Clean Your Phone? Volunteer judges met with participants to learn about their projects and inspire their STEM interest. During the SERC, visitors and participants also had an opportunity to tour SIUE’s Science West building, thanks to the Departments of Chemistry and Biological Sciences. Twenty-four winners from the SIUE regional are advancing to the state competition. A full listing of this year’s state representatives will be posted at SIUESTEMCenter.org. 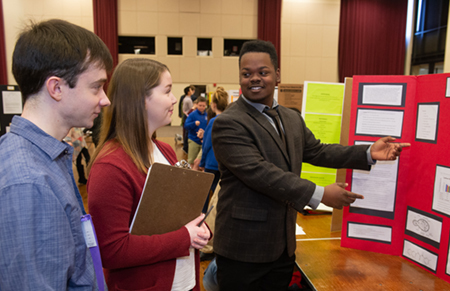 Photos: Edwardsville High School senior Amari Brooks presents his research to two volunteer judges during the regional Science and Engineering Research Challenge at SIUE. 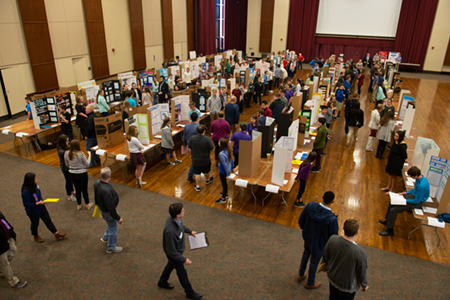 Approximately 150 participants, grades 5-12, presented their research at the Science and Engineering Research Challenge held at SIUE on March 23. 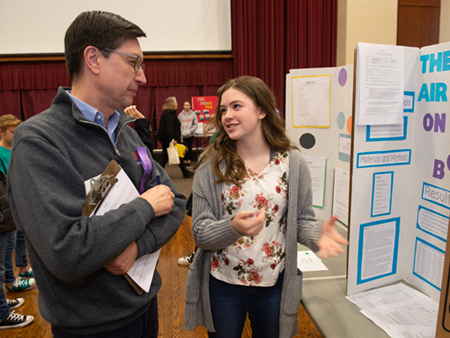 Julia Cox, an eighth-grade student at Maryville Christian School, describes her research project to volunteer judge Cem Karacal, PhD, dean of the SIUE School of Engineering.